Thanks to you and the KICKSTARTER community, we have reached our STRETCH GOAL of $12,000 and are now in the position to finish production on BOOKS: A DOCUMENTARY! Our journey is just beginning and we would LOVE for you to STAY INVOLVED! Please LIKE us on Facebook, FOLLOW us on Twitter, and SUBSCRIBE to our Blog for all the latest news and updates. We are thrilled and overwhelmed by all of your support throughout these past two campaigns and sincerely THANK YOU for believing in BOOKS. We can’t wait to save you a seat at the theatre. 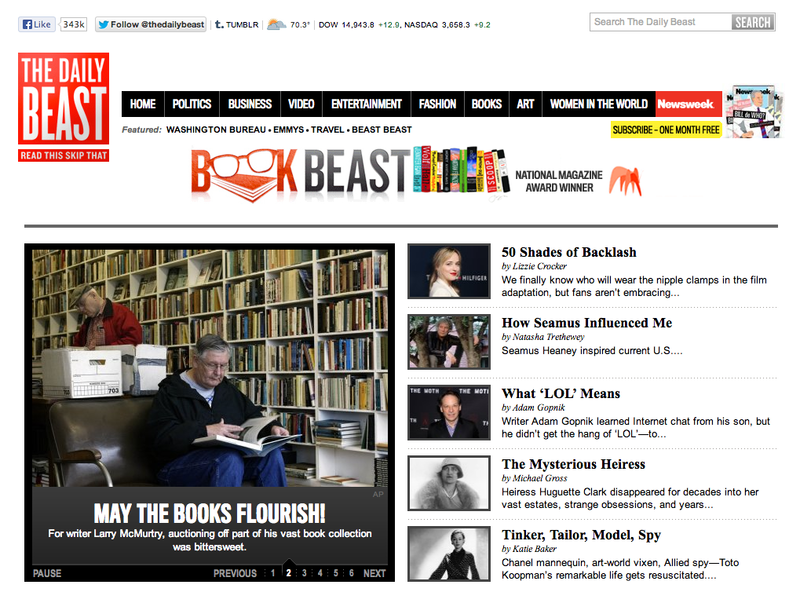 Larry McMurtry: May the Books Flourish! Larry wrote a piece for The Daily Beast today and we have it here for you… Enjoy! Art of various kinds is often expensive, and filmmaking especially so. Thousands of gifted filmmakers, young and old, have waited hat in hand at the studio gates, only to be turned away with nothing. That’s why Kickstarter and like organizations—which secure funding through donations from people with an interest in art-to-be—are a healthy and adventurous way to go. Let the studios eat cake, as a famous lady once said. Writing prose, on the other hand, is a solitary endeavor (unless one has a fine writing partner, as do I). And as such, it’s not very expensive. Paper, a typewriter, and a place to write is all I needed; that is, until I was given a laptop computer. I came to the world of computers at least 20 years late, thus missing whole generations of pods, tablets, and the like, which is too bad. Diana Ossana, my writing partner and close friend, purchased a MacBook for me recently, at my request. I let it sit for six months and then made a cautious approach to the keyboard, as one might approach a wary woman. I respect it greatly, and though I work at it every day, we are not yet on familiar terms. But maybe, if time allows, I’ll improve. 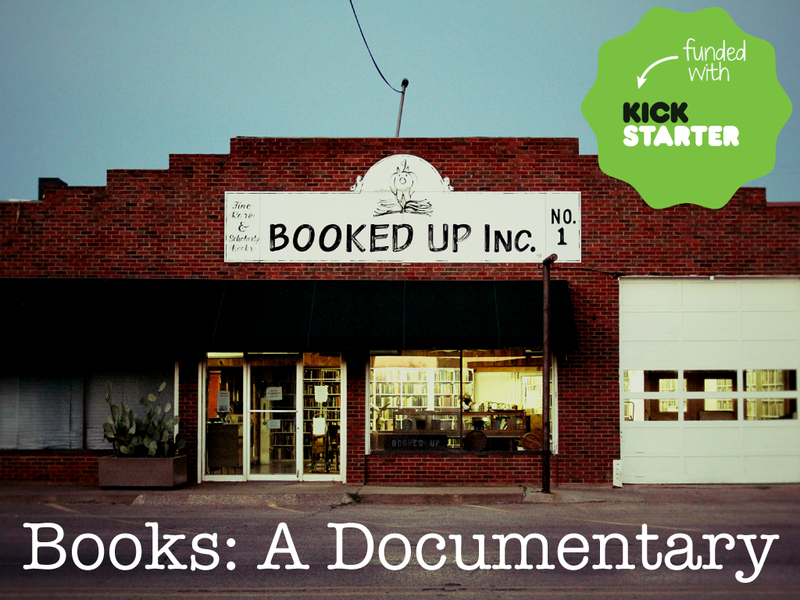 At present, the fledgling artistic project nearest to my heart is a worthy one called “BOOKS, A Documentary,” a film about my own passion for books, a passion that led me to create a book town in my home place of Archer City, Texas. At its peak, my book town harbored between 500,000 and 600,000 volumes, not counting my own 28,000 volume personal library. I love my books, all of them. Holding them in my hands, leafing through the pages, is a comfort to me. But this is a lot of books: my son and grandson might not be so inclined as to simply sit and appreciate their presence. So, I held an auction in Archer City over three scorching summer days in August 2012 to reduce the burden of books that might be left to my heirs, should I depart before my inventory does. I managed, during said auction, to launch two-thirds of said inventory back out into the world, all taking up residence with new and enthusiastic owners. The adventures of those books will be documented, should the smart young filmmakers have their way. It’s been a bittersweet experience for me, parting with my beloved stock, but they’ve been given a second life, on bookshelves and in storefronts all across America. Prince William and Kate Middleton have just had their first child, George Alexander Louis, but you may address the baby as ‘His Royal Highness Prince George of Cambridge’. Everyone loves to hear about a Royal Romance, doesn’t it just get you in the mood to watch some breathtaking romantic films based on books? I know you answered yes! Here is our top five must see Romantic film adaptations. When you think of romantic movies, The Notebook always comes to mind. Based on Nicholas Sparks’ novel of the same name, you can’t help but fall in love with the characters Noah Calhoun (Ryan Gosling) and Allie Hamilton (Rachel McAdams). Although their love story is an intense one, the ending is the perfect payoff. If you haven’t seen this flick already, go find it today, just make sure you have a box of tissues ready nearby. Based on C.S. Forester’s novel, The African Queen, is an exciting adventure-romance starring Humphrey Bogart and Katharine Hepburn. The film has been selected for preservation by the United States National Film Registry, for its culture, historical, & aesthetic significance. On Rotten Tomatoes, the movie holds a 100% fresh rating. Have I convinced you to watch it yet? You really should. If you watched the Oscars this year, you already know that Silver Linings Playbook received eight nominations, with Jennifer Lawrence winning Best Actress. Adapted from Matthew Quick’s novel, the film was written and directed by David O. Russell. In order to maintain the romantic comedy, yet emotional and troubled nature of the story, Russell claims to have rewritten the screenplay over twenty times. Go see/read it for yourself and find out if the movie did the novel justice. In 1847, Emily Brontë’s published her only novel, Wuthering Heights. Emily’s sister, Charlotte, made the decision for Wuthering Heights to be published after the success of her own novel Jane Eyre. The novel revolves around the destruction that jealousy and vengeance can cause on individuals and their communities. The film was nominated for eight Academy Awards, winning Best Cinematography. So, if you’re in the mood for some romantic vengeance, check this one out! The infamous story of Pride & Prejudice was published in 1813, written by Jane Austen. The well-known love story begins with the introduction of Mr. Darcy, a proud and condescending man, and his conflicting relationship with Elizabeth Bennet. The film, written by Deborah Moggach, strived to remain as faithful to the novel as possible. The movie had a positive critical reaction with Kiera Knightly portraying Elizabeth Bennet and Matthew Macfadyen as her romantic opposite. If you are looking for a classic love story, draped across the stunning English country side, this will sure to please. 2014 will be here before you know it. 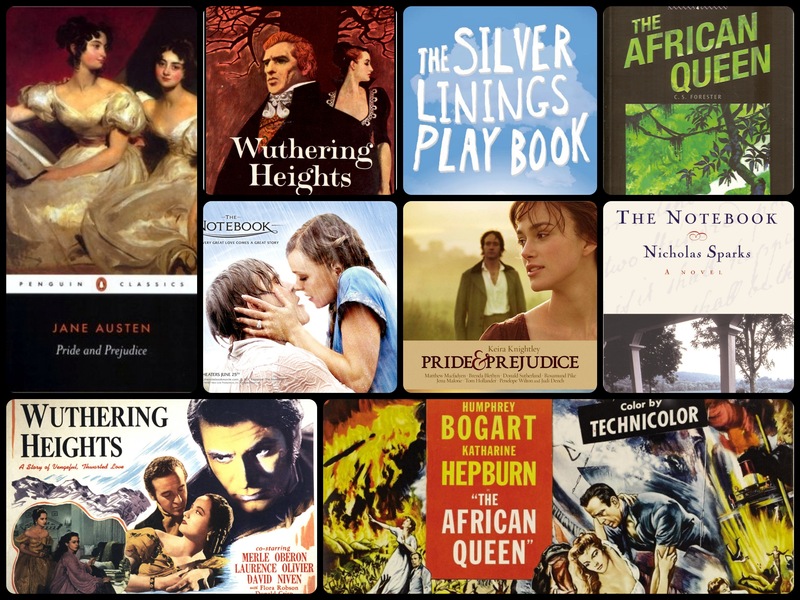 Check out these must-see movies adapted from your favorite books! Remember reading about that adorable English teddy bear’s adventures? Adapted from Michael Bond’s Paddington Bear, comes a live-action film that you won’t want to miss. And it’s true, the man most know as “House” will be the voice of Paddington Bear himself. The third, and final, installment of The Hobbit, based on J.R.R. Tolkien’s novel, will definitely be a popular holiday movie next year. After such stunning graphics and beautiful cinematography in The Hobbit: An Unexpected Journey, we all have big expectations for the final film! Even though The Hunger Games: Catching Fire is still on its way to theaters, Mockingjay is a film eagerly awaited! Without spoiling the story, you won’t believe what Katniss Everdeen’s done. So, around turkey time, watch out for the first part of the third, and final, installment of Suzanne Collins’ The Hunger Games Trilogy. James Dashner’s The Maze Runner is the first book in a post-apocalyptic trilogy for young-adults. Although the movie’s expected release date is Valentine’s Day, do not walk into this one hoping for kisses and candy. Directed by Wes Ball, this science-fiction mystery drama thriller will be one to see in the theaters. Do you remember seeing Sin City in 2005? The classic film noir never had a sequel. Until now! Coming in 2014, Sin City: A Dame to Kill For, will finally continue the story with many recurring actors from the first film. Including: Bruce Willis, Jessica Alba, Rosario Dawson, Mickey Rourke, and more. The film has been adapted from Frank Miller’s graphic novel by the same title. And SINce you have some time to KILL, why not read it first? Books is a feature film documentary directed and produced by Mathew Provost and Sara Ossana of Studio Seven7 Films coming soon. I grew up with writers in my family, as a result, books have always been a big part of my life. 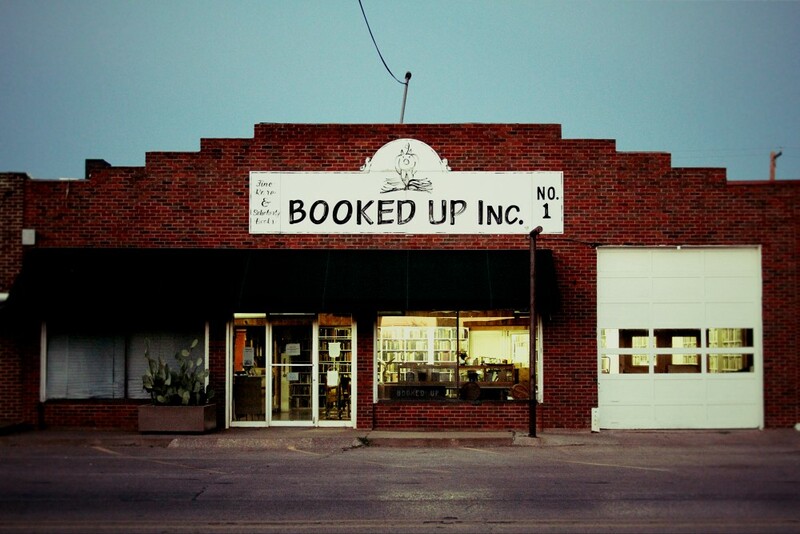 I first started visiting Booked Up in Archer City when I was 11 years old. I still remember the stillness and silence of the stacks, the smell of the books and endless possibilites as I spent hours leafing through and reading books on my favorite subjects: Photography, Fashion, Travel and Design. When Larry told me that he was planning on auctioning off over 2/3 of his inventory over 2 days, I knew that we had to document this once-in-a-lifetime event. As I spoke with Mathew about the inevitability of the auction, initially we were both sad, this was seemingly the end of an era. Larry expressed excitement about the auction and felt that it was not an end but a new beginning for these thousands of books, a way for young bookstores to replenish their inventory or start anew. A kind of diaspora of the years of acquiring his massive collection of rare, used and scholarly books. This mass exodus of books was feeding the book stream. Larry has a life-long history with books, both writing and collecting them, and this is our ode to him. Books is not only the story of the Last Book Sale but is also the story of the books themselves; what they represent and their value to those around them. We hope you will follow us on this journey as we finish the film and share the story of Books with the world.